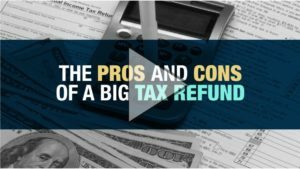 With the first post-tax reform filing season in full swing, people all over Kansas City are having to adjust to tax refunds much larger or much smaller than the refunds they are used to receiving. Whether you prefer to receive a big refund or not, nobody enjoys a big surprise when their tax returns are finally completed. At Windward we believe tax projections are a powerful tool in a comprehensive financial plan. We have been preparing a lot of tax projections for our Overland Park and North Kansas City clients over the past year, working to adjust withholding amounts and calculate accurate estimated payments. Whatever your preference is come filing season, it is always best to know what awaits you than to have a unexpected surprise. Check out the video below!